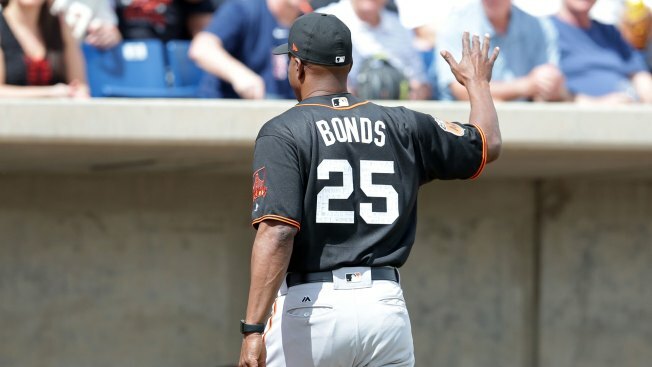 SCOTTSDALE, Ariz. -- The Giants knew Barry Bonds would step back into the box at some point. It happened Sunday, with Bonds taking a few cracks at BP pitches from Gary Davenport. Bonds warmed up with a couple of lighter swings and then blasted a homer to deep right. That was enough, as the 52-year-old walked away with a big smile on his face. Bonds is in camp as a special instructor, and he still picks his spots to show off his legendary swing. When he was the Marlins' hitting coach last season, he beat slugger Giancarlo Stanton in an impromptu home run derby.